Molded from high density polyethylene with varying amounts of plastic regrind and post consumer plastics these environmentally friendly waste containers won't rust or chip. 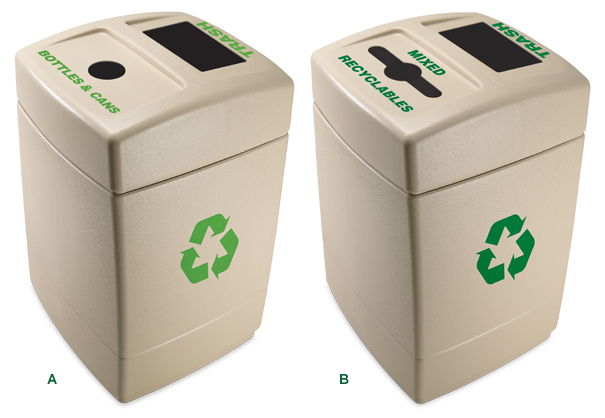 The large universal recycle symbol and product labeling clearly identifies container as part of a recycling program. Specific disposal openings separate and stores specific recycling and waste allowing for easy removal and lower maintenance. Two removable 27.5 gallon liners. Grab Bag™ System holds trash bag in place, eliminates slippage and maintains a clean appearance. UV inhibitors in material, to resist fading.